Actually, I wasn't familiar with barn quilts until Mrs. Shoes mentioned them in a comment on my "A Cupola For the Goat Barn" post. Quilting was my very first fiber love, so of course I had to look it up. After seeing hundreds of photos of beautiful barn quilts, I knew I wanted one too. Barn quilts aren't quilts in the traditional fabric sense; they are quilt patterns painted on barn doors or walls. Most of them are large and can be seen from a distance. I think they give a wonderfully decorative touch to a barn and apparently they have quite a following. There are barn quilt trails, tours, and books available around the country. My first step was to decide on a pattern. I got out my 849 Traditional Patchwork Patterns (republished as Classic Quilt Blocks: 849 Inspiring Designs), and began to consider possibilities. My finished quilt was going to be 4x4 feet, so I wanted a pattern that was a multiple of four squares. To further narrow down the possibilities, I decided to choose a block pattern with a nature theme, something with leaves, trees, mountains, or birds. I also wanted a pattern that would incorporate the X pattern on the milking room Dutch door. Those criteria narrowed my options, which helped a lot because I love all the patterns. I made a short list of possibilities, got out some graph paper and colored pencils, and played around with several that I thought might work well. Are they trees or fish? From looking at photos of dozens of real barn quilts, I observed two things. Since they are usually viewed from a distance, the pieces need to be large enough to see the pattern far away. Too small or too busy, and the pattern is indiscernible. It needs to be large enough to make visual sense from, say, the road. Also I observed that there needs to be good contrast in the colors. If the colors are too close in value (same depth of lightness or darkness), then the pattern becomes hard to distinguish at a distance. 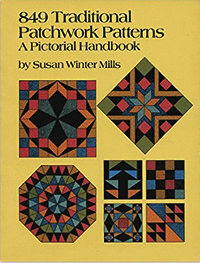 The best examples of barn quilts uses good contrast in their colors and kept the block pattern simple. I bought quarts of yellow, blue, and green, but colors never look the same on large areas than they do on the sample cards. I wasn't entirely satisfied, so I did a little mixing on my own to explore more options. Once the pattern and color decisions were made, I drew the pattern on my plywood and taped it off. I'm using two 2x4 foot pieces of sanded plywood because the finished quilt will become part of the hay loft doors. It should be ready to hang soon. Looking forward to that! Exciting! Looking forward to the finished project. Can't wait to see it. This is definitely on my to do list! It's going to be perfect and how cool to match your door. I can hardly wait to see it on your barn!!! Fiona, giving myself some parameters really helped in the selection process! Although making a barn quilt is well within my wheelhouse of expertise, I have a good friend that makes them for a living so I purchased one for my parents many years ago and helped to hang it on the back side of a barn facing towards the road. I so enjoy seeing that thing as I drive down their driveway (which is 1/8 mile long). They are sort of a gift that keeps on giving. Can't wait to see yours. I'm in the first stages of picking out a design for us, too! Although we don't have a real barn as you do, we have one end of the addition we put onto the house (winter workshop for husband and seed starting room for me) that faces the driveway as it comes into our place and that's where it will go. We're too far back in the woods so no one but someone driving into the yard will ever see it, but I know we'll all enjoy it as we come and go. Our daughter has volunteered to paint it for us. All I have to do is pick out the quilt block design and colors for her to work with. Looking forward with anticipation in seeing yours! I can't believe these weren't on your radar before the recent mention! But so glad you learned about them, because this will be so fitting for your farm and barn! You're gonna love it. My barn quilt is smaller but then its location calls for a smaller quilt. Its a white background with red flowers and green leaves. Don't know what the pattern is called but I really like it. Ed, they really are a lovely addition, aren't they? They make for a good landmark too! Mama Pea, how neat you're doing a barn quilt too! With your quilting expertise, I know it will be great. A little different than working with fabric, because fabric squares are pretty instant in terms of results but working with paint takes awhile to get the affect. Looking forward to learning more about yours! Sue, sounds lovely! I thought about making some smaller ones to hang in other places. The 4x4 will be perfect for the hayloft door. Can't wait to see the finished product! You're very creative. Hi Leigh! I can't wait to see it done! They are the bomb! Many a barn in my area and further up the mountain on the way to Nevada/Oregon have them. Always such a treat.I just might have to put that on my to do list although I was thinking about the front gate since my barns aren't very visible from the road. Nancy, especially when it's pretty! Goatldi, front gate would be a great idea too. When I looked at examples online, I realized they weren't just for the barn! Holy cow Leigh, that's so cool! I'll be eagerly awaiting the finished project! Mrs. Shoes, thanks! And good for Mr. Shoes to remember his wife's wishes. ;) My quilt is finally finished but we've had quite a bit of rain lately which has delayed putting it up. Hopefully that will happen over the next couple of days and then I can get photos and do a blog post!